reese cups are my weakness...oh my...goodness! Recently I tried a new instant pudding, Jello Instant Cheesecake pudding. Made with skim milk. Excellent, it was my entire dinner, I ate the whole thing! This I will HAVE to try.... Yummm!! 2 of my favorites too!!! Are you kidding me? I am totally craving chocolate and on a prednisolone for poison ivy (side effect increased appetite - like I freaking need that?). But I want to make them. I will let you know if I do. 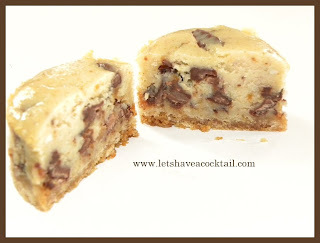 OH wow those look amazing.. absolutely amazing...once again I find myself drooling on someone's page..
i have one of those instant (add milk, mix and refrigerate) cakes sitting in my pantry - chips ahoy cheesecake i think - but resse's peanut butter cups sounds so much more delicious! YUM! I will have to try this recipe. cheese cake and Reese's cups. what could be better?? OMG, that sounds great! I am going to have to try it! I am so ready to eat one of these! It's been that kind of week! Oh. My. God. You got peanut butter and chocolate in my cheesecake. You are tightening your grip on me ever so cleverly. This sounds fantastic and pretty simple. Yummy. printing the recipe as I type. This will be Sunday dinner's dessert. Damn you! Is there a mystery weight loss ingredient laced in here somewhere? Bathing. Suit. Season. Wow, that sounds delish. I will try to make for Husband then he will be in dreamland. Done. I am definitely making these. I think I could taste the picture. Oh yum, sounds absolutely delicious! Oh wow. It's bad that this recipe is so easy. Really really bad. I would thank you for sharing, but really my thighs should be thanking you in advance. They're already expanding in anticipation. Er - did no one tell you Easter was last weekend? Or did you not overindulge sufficiently and feel you have to make up for it this week with posts about all things chocolate?!? mmmm, those look super yummy! You. Are. So. Cruel. Reese's Peanut Butter Cups are on my list of things I adore but cannot have because I live Down Under. Combining RPC's with cheesecake? That is beyond torture. I am calling Amnesty International on you. Seriously, thanks for the recipe. I will live vicariously through you. This sounds like HEAVEN. I'm always looking for new desserts to make for parties, so thanks for sharing. Plus, I love anything that's mini-sized—it's so freaking cute! I'm making this for my next bookclub. Oh.My.Gah...you are trying to kill me!! Cream cheese? That's all you had to say! These sound wonderful!! I should give them a try. Oh man, that sounds so freaking good!!!! You KNEW, just KNEW i needed this, didn't you? Awesome, plain and simple. OH MY GOD. I'm totally making these for my BBQ with my quartet at the end of the month. Hrm, wonder if I should make them before hand. You know... just to make sure they're the perfect thing ;) Thanks JM! mmmm that's like all my favorite things in one recipe. yummy. dang. I just finished eating all the peanut butter cups left over from Easter. sigh. These could seriously be trouble in my house. YUM! I wonder if I can convert this to gluten and dairy free? That sounds so delicious. It took me a week to decide to eat better so I guess I have to postpone it for a few day, oh well....such is life,lol. I'm your Newest fan on your blog and twitter! Lovin' these little bites! They are on the list to be made! I have Guest Chef post on my blog maybe you'd like to do it too? I'd be honored to have ya! Stop in and lmk! They're mini so I am sure all the fat and calories just bakes right out of them, right? :) They sound super delicious! Those look yummy and way sweet for the tooth! I do lurves me some Reese's! Fabulous recipe. That will be on my list to make this week. These look like the perfect little afternoon snack! Yum! Hi there. Dropping by to toss confetti, pull up a virtual chair and party with you. Let's have some fun! I've got my Ultimate Blog Party 2010 post up at Dayngrous Discourse. Plus, I've got my first giveaway too. I hope you'll surf on over and say hello. You are an evil woman for posting these. I need them. Now. But seriously these look divine. Will be making them soon!! Ohmygah. They LOOK SO GOOD. And FATTENING. It's like you're the devil, masking yourself with this really good blog. You've combined my two favorite things into one, so I guess I just HAVE to make these! Maybe after my race in 3 weeks :) Then I can eat them without guilt! Thanks for sharing! Sounds amazing! I love PB cups and Cheesecake. I'll have to try them soon. Did you just now get a button? How did I not notice this? Grabbing it and will put it on my blog. you had me at peanut butter... I am following you back.